Carmen Harra, was born in the Northern Region of “Romania” known as “Transylvania”. When she first came to “America”, it was to follow her dreams of becoming a singer, she was offered a recording contract and began to prepare herself for the demanding world of the entertainment industry. But she soon noticed a change within her soul, a deeper burning desire to enter the metaphysical world, her passion helped her understand that spirituality was something that most human beings wanted to understand but needed more knowledge in order to connect themselves to the spirit world. 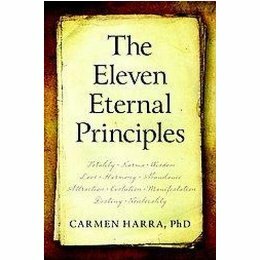 Carmen Harra, began her study of various intense human behavior courses and soon became a metaphysical intuitive and counselor, she holds a Ph.D in Hypnosis, Alternative Healing, and Clinical Psychology. “Dr.Carmen Harra, has penned a special book that illuminates the spiritual life, If we find meaning in the challenges that confront us , we can break through to a life of growth, mission, and ongoing miracles.” ~James Redfield, author of “The Celestine Prophecy”……. In numerology, eleven is a master number. Ten is the number of completion while one is the number of beginnings, so eleven represents the time of change, when something is dying and something else is born. It is the number of rebirth and spiritual enlightenment, marking the connection between endings and beginnings. The First Eternal Principle: The Law of Totality~All people and all creatures are one, united with the divine. The Second Eternal Principle: The Law of Karma~What you do and what happens to you is the result of your soul’s choice to come to Earth, learning many lessons while you are here. The Third Eternal Principle: The Law of Wisdom~Wisdom is knowing what you can and cannot change, accepting those limitations in this reality; and choosing to use your suffering as a tool for learning about yourself and growing spiritually. The Fourth Eternal Principle: The Law of Love~Pure, Unconditional love heals our Karma, and our hatred reminds us of our divine nature. The Fifth Eternal Principle: The Law of Harmony~There is divine order in the universe, and we are meant to be in harmony with everyone and everything. The Sixth Eternal Principle: The Law of Abundance~Abundance is the energy state that manifests material wealth and other, more important forms of wealth. The Seventh Eternal Principle: The Law of Attraction~The universe works with us to bring us what we desire. The Eighth Eternal Principle: The Law of Evolution~God intends for us to continually evolve to a higher state of consciousness. The Ninth Eternal Principle: The Law of Manifestation~The Power to manifest what we desire is our birthright and we are constantly co-creating reality with the help of the divine. The Tenth Eternal Principle: The Law of Destiny~ We are flawed creatures, driven to unite ourselves with God and end our suffering, choosing to take human form in order to purify our souls, rid ourselves of Karma, and reunite with God for all eternity. The Eleventh Eternal Principle: The Law of Nonlocality~We can defy the laws of time and space, and participate in the co-creation of the seemingly impossible. Carmen Harra, has been featured in the New York Times, New York Post, New York Daily News, Vogue, New York Magazine, appearing on the following TV programs: Good Morning America, The View, Fox news, The Today Show, The CBS Early show, What’s the Buzz on ABC, Telemundo, Channel 11 news, Good Day New York, QVC, Happy Hour on Pro TV International. She has hosted her own radio shows on Sirius Satellite, Healthy Life Network, and Contact Talk Radio,, where she is currently hosting “Decoding your Destiny”. She has been featured on Barbara Walters radio talk show. Carmen has met some amazing people in the Entertainment Industry and has even coached some of them in their personal and professional lives. Carmen has worked with Candice Bergen, Jennifer Lopez, Whoopi Goldberg, Ben Affleck, Liza Minnelli,Kathy Najimi, Caroline Rhea, Jerry Springer, Denise Rich, Courtney Cox. Carmen Harra has designed a wonderful line of Psychic Jewelry…..featured on QVC and can now be purchased through Carmen’s website www.carmenharra.com . The Judaic symbol of the essence of life and soul…..
(BG) Carmen, thank you so much for being a part of the “Beautiful Goddess”. We feel all women are beautiful and deserve to be treated like goddesses. We see you as the “Spiritual Goddess”. One that delivers the messages to us so we can bring change to the world. What advice can you give to the women that are trying to go after their dreams in the “New Year”? (CH) Pursue your dreams (People who don’t dream, don’t have too much) Don’t be afraid to think big and to believe in yourself. If you don’t believe in you! nobody else will. Acknowledge your power, be strong and make it happen. You are born to win. Be a winner!! (BG) I remember going to “Barnes & Nobles”, and picking up a copy of your book “Everyday Karma”. I had no idea of you were? But as I began to flip through the book, and read some of the pages, I was amazed at some of the predictions that were written. I am happy to say that I did purchase the book, and I became one of your many fans in the world! so here we are in the future years, and many of the predictions have manifested into reality. Right now we are once again looking in that same direction and the year “2012”, seems to be the time that most people are asking about? some individuals are very nervous about that coming year, while others are very calm. Do you think there will be more destruction to the earth or do you predict a healing that can take place. What are your thoughts? (CH) 2012 is the end of the Kaly Yuga, the last of over 5000 years on “Earth”. It was the era of guns, killings, wars. 2012 is also the beginning of the ‘Golden Yuga”, the era of peace, longevity, and prosperity. Its also the end of a cosmic year that lasted 26,000 years. The cosmic year has 4 seasons called Yugas in Hinduism. The worse of all seasons with a very low level of consciousness is the Kaly Yuga. But December 21st, 2012 carries the energy of the number 11, which means “Light”. The coming times are so beautiful, we just have to get there. (BG) The new book “Eleven Eternal Principles” is available on the internet as well as bookstores, you just launched a book signing hosted by “Morgan Le Fay”, on Madison avenue in NYC. Will you be traveling to different cities for a book tour? How are the readers responding? (CH) The response is fantastic and I’m grateful for that. I will do a Radio Tour and lots of upcoming appearances for television. (BG) The one thing I admire about the new book, is the fact that you have given us a breakdown of lessons we can all incorporate in our daily lives, you stress living with simplicity. As a writer, author and one that receives these powerful messages, do you feel human beings are more aware of spirituality because of what is happening in the world today? (CH) We need these lessons more than ever in order to cope with the monumental transformation the world is going through. (BG) Your jewelry line is amazing! and holds meaning behind every piece. you launched this line a couple of years ago on QVC, there are inspirational messages and spiritual descriptions. 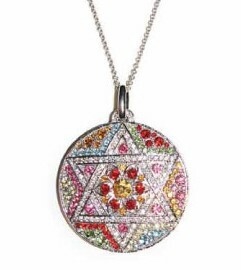 Many designers today are starting to incorporate this in their own lines of jewelry, handbags, clothing. But you were one of the first to speak about “Psychic Jewelry”. How do you feel about this and do you think people are more comfortable wearing and showing off these expressions?. (CH) The origin of jewelry comes from the idea of protection and empowerment. As we rise to the level of perception we become more aware of how important it is to wear something that has a powerful symbol and meaning behind it. (BG) Dr. Harra, you have now penned 6 amazing books and released 3 music CD’s. What can we expect of you in 2010? Will you return to “Romania” for upcoming television appearances? I know the people in your country have so much love and respect for you. We are all looking forward to seeing more of you and your work in 2010. (CH) I’m continuing my work, doing a new CD, a new jewelry collection, a new book and a new me!! I will travel to Europe this year to promote my new book, and of course I will be in “Romania” for a new TV show. I will continue to celebrate my life, and I want all of you to do the same. Life is the gift of God, and in the years to come we will make “Life on Earth the Kingdom of the Divine”.